In 2012, the US population was 313 million. Growing diversity continues to produce striking changes in the population. To provide an accurate way to track these changes, Esri created a proprietary Diversity Index that measures diversity on a scale from 0 to 100. The Diversity Index is defined as the likelihood that two persons, selected at random from the same area, would belong to a different race or ethnic group. For example, if an area’s entire population belongs to the same race or ethnic group, the Index is zero and the area has no diversity. Conversely, if the population can be evenly divided among two or more race or ethnic groups, the area’s Diversity Index increases to 100. The Diversity Index measures only the degree of diversity in an area, not its racial composition. 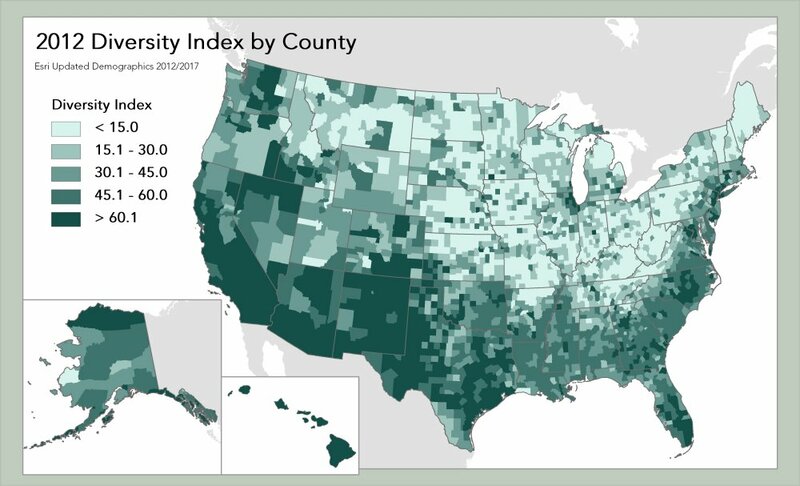 Esri’s Diversity Index for the US has risen from 60.6 in 2010 to 61.4 in 2012, with a forecast to increase to 63.8 within five years. Esri’s diversity calculations accommodate up to seven race groups: six single-race groups (White, Black, American Indian, Asian, Pacific Islander, and Some Other Race) and one multiple-race group (two or more races). Each race group is divided into two ethnic origins: Hispanic and non-Hispanic. If an area is ethnically diverse, then racial diversity is compounded. The Diversity Index is part of Esri’s 2012/2017 Updated Demographics database. Delivered in a wide range of geographies, formats, and variables, Esri’s Updated Demographics is available as an ad hoc database that integrates seamlessly into GIS software and is packaged in the Business Analyst products, Community Analyst, and ArcGIS Online. For more information about Esri’s 2012/2017 Updated Demographics, visit www.esri.com/demographicdata.